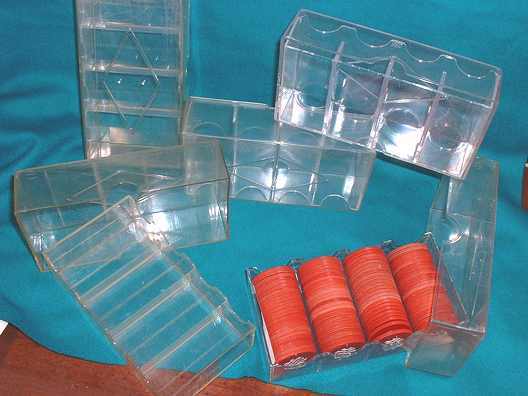 RACKS FOR SALE: I have chip racks for sale; click here. If you buy a set of chips here, I could sell you a basic wooden capacity carousel for $10,mahogany a 300-chip capacity for mahoganyy $20-$25. ... ... 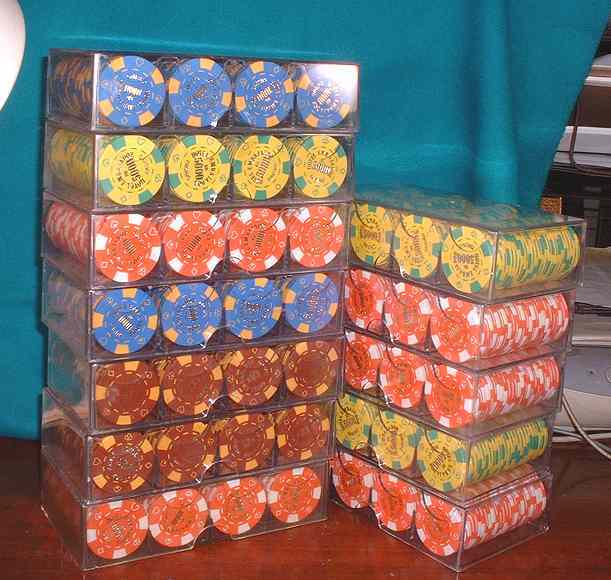 .....I could also sell you a 100-chip capacity plastic, transparent chip box (very box-like and stackable) for $3.00 each. 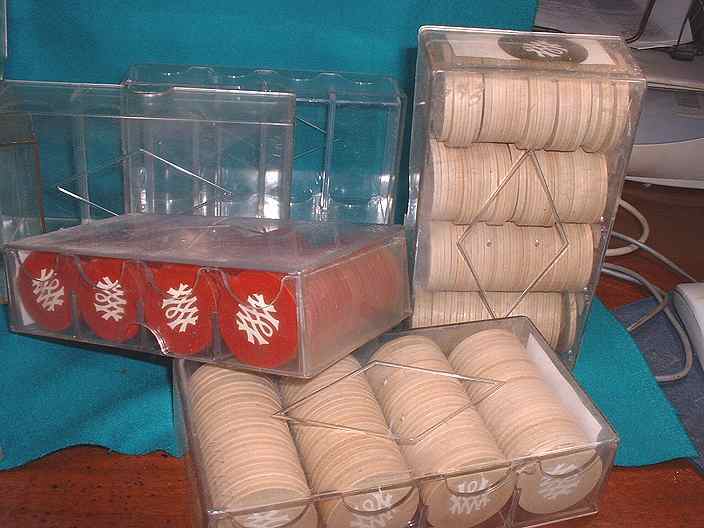 I strongly recommend these boxes -- they are economical. sturdy and flexible. They hold the most chips in the smallest odd spaces than any other chip holding device. This is obvious, but I'll say it anyway: the transparency of the boxes is a great feature: you can quickly see what chips are inside, and you can hang a nice label inside at the end of the bottom piece and see it from the outside through the top piece. To see pictures of these, click here, here, and here. ¶ mint condition -- still in its origianl shrink-wrap plastic. 12 gram chips. 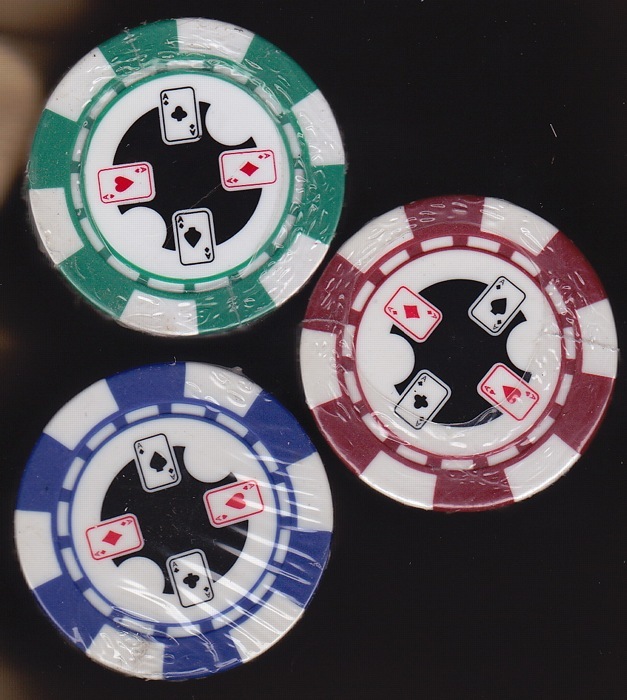 ¶ ABS Composite Poker Chips (plastic polymer) with metal insert for weight. ¶ picture is distorted some because scanned with chips in original shrink-wrap. ¶ Click here for large picture of all three chip colors.